. : Optics & Photonics Focus :: Make Two, Keep One :. To generate single photons remains a challenge, to have them in a pure, well-defined quantum state even more so. Now this is possible, thus paving the way for future quantum technologies and applications. Generation of a pure sigle photon. The laser pulse (blue) enters a non-linear crystal that generates two photons (red, middle). A polarizing beam splitter is then used to separate the two photons of which one is used as a trigger (left) to indicate that there is another photon (right) ready to be used. Light is all around us in all possible colors, polarizations and intensities. But, despite the omnipresence of light in nature, it is difficult to generate a single photon, and it is even more difficult to get it in a pure quantum state. In the Clarendon Laboratory at the University of Oxford (UK), Peter J. Mosley and his collaborators have accomplished this. They have produced pure single photons using a nonlinear optical process. Since it is extremely difficult to obtain a single photon, the authors have opted for generating two but only holding on to one of them: make two, keep one. Since the concept of photon was proposed over 100 years ago, it has come to revolutionize science and technology. A single photon is the tiniest bit of light. "A single photon," Mosley explains, "is a discrete packet of energy that exists as a single excitation of the electromagnetic field that makes up light." In most everyday situations, light is made up of such a vast amount of photons that a single one cannot easily be isolated. One could be led to believe that single photons could be isolated by sufficiently attenuating a light source. This approach works to a certain degree. What is obtained, however, is a statistical mixture of pulses of zero, one, two, or even more photons. Be that as it may, it would be possible to measure the number of photons present in a certain pulse; such measurement, however, would destroy the photons and make them unavailable for further use. Therefore, more sophisticated techniques are needed to build a so-called photon-gun, which generates single photons on demand. But why would one be interested in single photons? and why in a pure quantum sate? Single photons in a pure quantum state may prove to be the building blocks for future quantum technologies. These technologies promise enormous improvements over their classical counterparts in terms of speed or security, for example. In quantum information processing, single photons may be used in quantum logic gates, playing the role of electrons in current electric circuits. "In a classical computer", Mosley points out, "information is stored as a series of bits — groups of electrons that represent either the value of 1 or 0. In optical quantum information processing these bits are replaced with quantum bits, called qubits, that can exist in what is known as a superposition state — a qubit can exist simultaneously in both the 1 state and the 0 state." 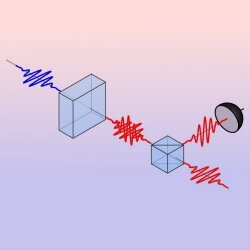 And this possibility of superposition is at the very heart of computational speed-up: a quantum computer is a highly parallel machine, intrinsically so, which can sustain a large amount of computations taking place, on the same physical support, at the same time. It is difficult to make single photons on demand; on the other hand, it is relatively easy to produce pairs of photons. The process of Spontaneous Parametric Down Conversion (SPDC) is one of the most convenient ways to produce pairs of photons. In SPDC a strong pump laser beam is shone onto a special kind of crystal. Occasionally a pump photon disappears and two new photons are created simultaneously. The production of pairs in the nonlinear crystal is probabilistic as in the case of an attenuated laser. Be that as it may, the fact that precisely two photons are produced simultaneously is an advantage. Therefore, the two photons can be taken apart and one of them can be used as a trigger (herald) to indicate the presence of the other, thereby telling us when a photon is ready to be used. These pairs of photons have special types of correlation in their color (frequency), in their spatial shape, and/or in their polarization. For many applications, such as in quantum cryptography, these types of correlation may be useful, but at the moment of generating pure single photons they are detrimental since they diminish the purity of the single photon. As long as the two photons are correlated, they are not independent of each other and, as a consequence, not in a pure, well-defined quantum state. Mosley and his collaborators have managed to destroy the color correlation between the two new photons. They have produced heralded pure single photons. "This lack of correlation means that knowledge of the frequency of one photon gives no additional information as to the frequency of the other," Mosley explains. The spatial correlation was destroyed by generating photons with orthogonal polarization, while the color correlation was destroyed by carefully selecting the nonlinear crystal material and the color of the pump laser beam. The purity of the heralded single photons is reflected in the lack of frequency correlation between pairs of photons. To demonstrate the purity of the single photons generated in Mosley's experiment, two identical single photon sources were used and the single photons were sent through a beamsplitter to observe the interference pattern. In technical terms, 4-photon coincidences were measured when the path of the interferometer was changed. Two of the four photons counted were used as triggers to signal when the heralded single photons were headed towards the interferometer. Mosley explains that "the visibility of the interference critically depends on the spectral correlation that exists in the photon pairs. What is more, the visibility of the interference pattern reveals the purity of the heralded single photons. In order to ensure that interference always occurs at the beamsplitter, the two heralded photons must be in pure states." The demonstration of the generation of pure heralded single photons represents a step towards the implementation of quantum technologies and a way towards a deeper understanding of the foundations of physics. Warren P. Grice at the Center for Quantum Information Science of Oak Ridge National Laboratory (Tennessee) remarks that "the techniques laid out by Mosley and his coauthors' work overcome a number of fundamental stumbling blocks on the path toward the deployment of real quantum optics applications requiring multiple single photons. For the first time, they have demonstrated a heralded photon source in which the heralded photon is in a pure state." Grice is convinced that this is an important step towards the applicability of quantum states in technology and he has no doubt that soon "more hands on the table will bring more ideas and more applications." XS is currently working on his doctoral thesis at ICFO - The Institute of Photonic Sciences, Barcelona (Spain). Peter J. Mosley, Jeff S. Lundeen, Brian J. Smith, Piotr Wasylczyk, Alfred B. U’Ren, Christine Silberhorn, and Ian A. Walmsley, Heralded Generation of Ultrafast Single Photons in Pure Quantum States, Physical Review Letters (2008) 100, 133601 (link).